Mast Sagawa (佐川眞人; bornAugust 3, 1943 in Tokushima, Japan) is a Japanese scientist and entrepreneur,and the inventor of sintered permanent magnet NdFeB. Sagawa was awarded theJapan Prize in 2012 for inventing and developing the highest performingsintered Nd-Fe-B type permanent magnets and contributing to energyconservation. 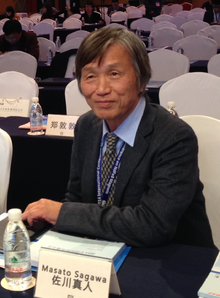 Dr. Sagawa is the president of NDFEB Corporation at Kyoto, Japan.NDFEB Corporation is currently establishing the ultimate production processing for producing the most powerful permanent magnets NdFeB to be used in Sustainable energy. Masato Sagawa was born in TokushimaPrefecture, Japan in August 3, 1943. Masato Sagawa graduated from Amagasaki City High School in 1961. He received his B.A. from Kobe University in 1966,his M.S from Kobe University in 1968, and his Doctorate degree from Tohoku University in 1972. Dr. Sagawa demonstrates how 1 gram of NdFeB magnet disc can firmly hold ~1900 grams of water bottle. The sintered NdFeB was initially conceived anddeveloped by Sagawa when he was with Fujitsu Laboratories where he worked from1972–1982. Without his supervisor’s support for the new magnetic compound,Sagawa resigned in 1981, and then joined Sumitomo Special Metals. Within several months after joining Sumitomo Special Metals in 1982, the strongest sintered NdFeB magnet was developed. Dr. Sagawa presented the new discovery ofNdFeB magnet during the Magnetism and Magnetic Materials Conference in Nov.1983 in Pittsburgh, Pennsylvania. In 1988, Sagawa founded Intermetallics, aresearch and development company devoted to the development of neodymium magnets.Dr. Sagawa founded NDFEB Corporation in 2012 and he is the president of NDFEB Corporation at Kyoto, Japan, and he is currently establishing the ultimate production processing for producing the most powerful permanent magnets NdFeB to be used in Sustainable energy. Previous：Rare-Earth Market By monopolizing the mining of rare-earth metals, China could dictate the future of high-tech.